The ShootOut at the Bonneville Salt Flats is officially canceled ..per..
KillaCycle Racing has posted a few more pictures and statements. The short story is, that while the rain has let up the organizers will decide on Monday whether to cancel the event. 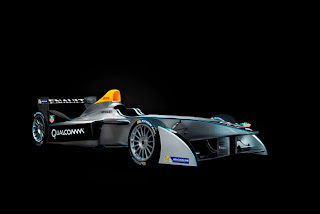 Drayson Racing and Qualcomm Halo have signed a deal to "include Qualcomm Halo WEVC technology in [Drayson]'s products." Hurm, I didn't know Drayson Racing had products, I just thought they were a racing team. In any case the press release says that Drayson Racing will be able to "make and supply products including Qualcomm Halo WEVC technology to customers in the motorsport and automotive sectors,"
Given that Formula E, a racing series in which Drayson has a team, recently signed a deal with Qualcomm Halo making them technical advisers .. one wonders what role Drayson Racing played in hooking them up? 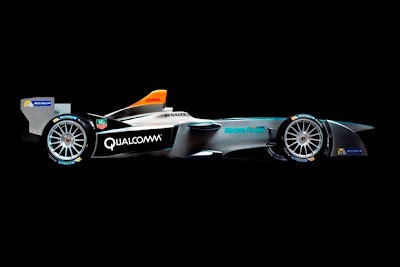 This is idle speculation - but suppose that Drayson Racing is a middleman between Qualcomm Halo and Formula E? I have no proof of that just putting two facts next to each other and seeing how they fit together. FWIW Drayson Racing has had Qualcomm Halo technology in their race car for a long time. Drayson Racing Technologies LLP, the low-carbon motorsport and electric vehicle R&D business, today announced that it has entered into a wireless electric vehicle charging (WEVC) licence agreement with Qualcomm Incorporated to include Qualcomm Halo WEVC technology in its products. Qualcomm Halo WEVC technology enables the wireless charging of electric vehicles via a pad in parking space. It is a technology that is likely to radically improve EV infrastructure and uptake. Revolutionary dynamic wireless charge-on-the-move systems are also being developed. The licence agreement enables DRT to make and supply products including Qualcomm Halo WEVC technology to customers in the motorsport and automotive sectors. The license agreement builds upon the Oxford-based firm’s role as an Official WEVC Performance Motorsport Development Partner for Qualcomm Halo technology in high performance motorsport. Qualcomm Europe Inc. announced in January this year its sponsorship of the Drayson Racing Team to promote Qualcomm Halo™ WEVC technology during the launch phase of the new FIA Formula E Championship. 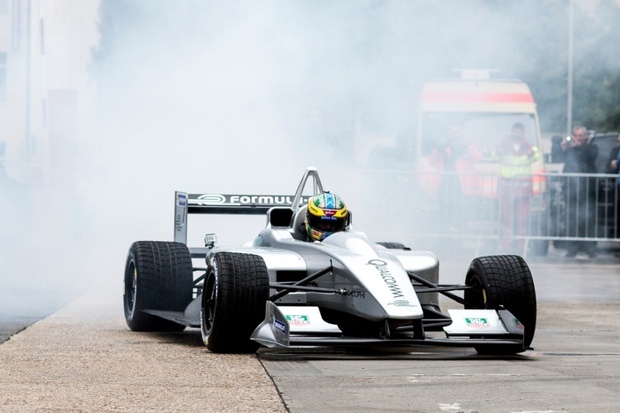 DRT has been testing a specially developed 20kW, high power Qualcomm Halo wireless charging system on the Drayson B12/69EV prototype electric racing car. DRT is developing systems for use on road going EVs and for electric racing cars that will participate in the forthcoming FIA Formula E Championship. DRT and Qualcomm Europe have been rigorously testing the Qualcomm Halo WEVC system. Testing has taken place during high-speed trials and under racing conditions, including setting a new hill-climb electric vehicle record at the Goodwood Festival of Speed and establishing a new world land speed record (subject to FIA homologation) in June of this year for sub-1000kg electric cars. “We are delighted to announce this further development in our relationship with Qualcomm, a global leader in wireless technologies. Qualcomm’s commitment to innovation makes it a perfect fit for Drayson Racing Technologies and our shared commitment to sustainable technology development through motorsport competition. We are looking forward to applying this breakthrough technology to the next generation of high performance electric road and racing cars”. KillaCycle Racing is back at the Bonneville Salt Flats for "Mike Cook's ShootOut". Racing was originally scheduled to start on Friday ..but.. heck Eva wrote it pretty well, so rather than rephrase it, I'll paste it in here. I will note that, as Eva says, Drayson Racing is there as well. Brammo challenges Formula E's SRT_01E to a race .. who would win? And: An 800kg car with 200kW (270 bhp) or a 200kg bike with 130kW (170 rwhp)? Unfortunately, Brammo doesn't post a spec sheet on the Empulse RR page - though, even if they did, they're constantly working with suppliers like Parker-Hannifin to improve things. What it means is that our ability to engage in the "my ___ is faster than your ____" game is limited because we can't compare specs. The main thing we'll notice is that the SRT_01E has a more powerful drive train, but the Empulse RR is both lighter and as a motorcycle would be able to outmaneuver the car quite easily. Especially with a top rider on-board like Shane Turpin or Eric Bostrom. By the way, an interesting factoid ... Of that 800kg weight, 200kg is the battery pack. That's the weight of the entire Empulse RR. The SRT_01E has a top speed of 225 km/hr or about 140 miles/hr. The 2012 Empulse RR did 170 miles/hr at Daytona last year. At Laguna Seca the 2013 Empulse RR was doing 140+ miles/hr in some sections of the track. Because Laguna Seca is a very twisty track, the speeds are limited, where Daytona is built for ultra high speed with long straights and banking. In other words, the Empulse RR has more raw speed than the SRT_01E on a smaller lighter frame and smaller battery pack. 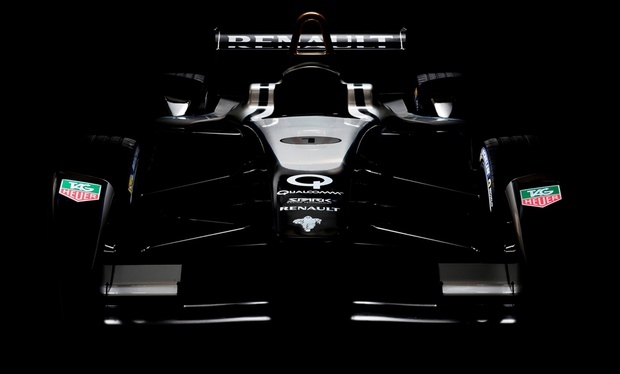 The FIA Formula E World Championship series has unveiled the long-awaited SRT_01E electric race car, but did not (in their press release) answer some of the questions I've had about the series. Specifically they did not answer anything about how the race will be conducted. The SRT_01E has been designed by a consortium of companies who say they're attempting to push the boundaries of what can be done with electric race cars. The race length is supposed to be 60 minutes, and each car able to race for 20-25 minutes at a go. That means drivers will have to swap cars halfway through the race. However two cars provides 40-50 minutes of racing time, for a race that's supposed to last 60 minutes. Doesn't quite add up. In the pictures notice the Qualcomm logo. They recently signed Qualcomm as a technical partner who will be providing wireless charging systems starting in the second season. FRANKFURT, GERMANY (September 10, 2013) – FIA President Jean Todt and Alejandro Agag, CEO of Formula E Holdings, revealed the much-anticipated new Spark-Renault SRT_01E fully-electric single-seater during the opening day of the prestigious 65th International Frankfurt Motor Show. 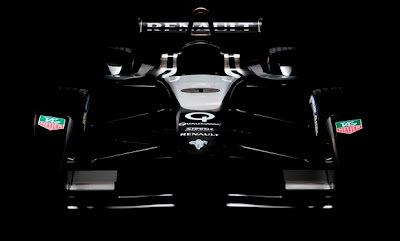 For more information visit www.fiaformulae.com. 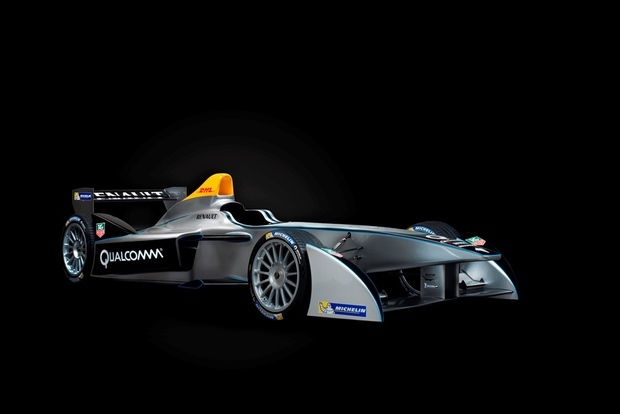 Formula E is a brand new FIA championship featuring Formula cars powered exclusively by electric energy. It represents a vision for the future of the motor industry over the coming decades, serving as a framework for research and development around the electric vehicle, accelerating general interest in these cars and promoting sustainability. Commencing in September 2014, the Championship will compete in the heart of 10 of the world's leading cities - including London, Beijing and Los Angeles - racing around their iconic landmarks. For the inaugural season, 10 teams, each with two drivers, will go head-to-head creating a unique and exciting racing series designed to appeal to a new generation of motorsport fan. Operating as an 'open championship', the series gives car manufacturers and constructors the opportunity to showcase their electrical energy innovations in a racing environment, designing cars to the technical specifications set out by the FIA. www.fiaformulae.com. As well as being the official Formula E tyre supplier, Michelin is an official partner, at the international level, of the FIA Action for Road Safety campaign. This program is designed to support the Decade of Action for Road Safety initiated by the UN, the aim of which is to save five million lives over the next ten years. This program is set up to educate and advocate for safer roads, vehicles and behaviours around the globe. Porsche recently unveiled the Porsche 918 Spyder, a flat-out race car with a plug-in hybrid electric drive train enabling high speed racing, high efficiency and low emissions. This week they've gone to the Nürburgring Nordschleife to do what so many have done before, see how fast they can go around the ring. Over multiple runs with multiple drivers, they smashed the existing lap speed record, achieving a fastest lap time of six minutes 57 seconds over the 12.8 mile route. This bested the previous record for street-legal cars by about 14 seconds. The Wikipedia page for Nürburgring lap time records lists two faster times by Michael Vergers driving a Radical SR8. Because Porsche says they have the fastest lap time for street legal production vehicles, they have to be ignoring these two faster lap-times by saying the Radical SR-8 is not street legal in the way the Porsche 918 Spyder is. Atlanta. The Porsche 918 Spyder* has conquered the 12.8-mile (20.6-kilometer) lap around the Nürburgring Nordschleife in less than seven minutes. Achieving a time of six minutes and 57 seconds, the super sports car equipped with a hybrid drive shaved 14 seconds off the previous Nürburgring record for a street-legal automobile, and 17 seconds from its run last September. Wolfgang Hatz, member of the Porsche AG Board of Management in charge of Research and Development, had the following to say: "We promised a great deal with the 918 Spyder, namely to redefine driving pleasure, efficiency and performance. We have kept our word." As is the case with Porsche, the 918 Spyder is also leading the way for future generations as the latest in the line of super sports cars. It is currently making its global debut at the International Motor Show (IAA) in Frankfurt. With its unique spread, the model blends maximum driving dynamics with minimal fuel consumption. 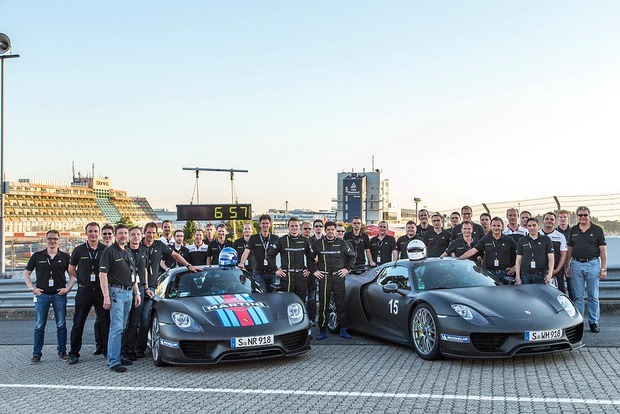 By taking the Nürburgring record, the 918 sports car is demonstrating the enormous potential that lies in Porsche's pioneering plug-in hybrid concept, and is underpinning the leading role the company enjoys when it comes to developing sporty hybrid vehicles. "The radical hybridization of the 918 Spyder from the very outset is what made this lap record possible," says Dr. Frank Walliser, head of the 918 Spyder project. "The lap time on the Nordschleife is and remains the toughest measure of a super sports car. Posting a time of 6.57 minutes, we achieved a result of which everyone in the development team and at Porsche as a whole is rightly proud." The record, which was previously held for four years, was broken during the first attempt in the test drive on the morning of September 4. 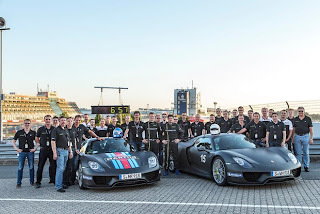 All three drivers – former European Rally Champion Walter Röhrl, Porsche test driver Timo Kluck and Porsche factory driver Marc Lieb – were quicker than the existing record with each lap driving a different 918 Spyder, and posted lap times of less than seven minutes on numerous occasions. Ultimately, it was Marc Lieb who posted the absolute best time of 6.57 minutes, driving at an average speed of 111.5 mph (179.5 km/h), as measured by Wige Solutions. Marcus Schurig, editor-in-chief of the sports car magazine "Sport Auto,” was on hand as an objective observer of the record-breaking runs. 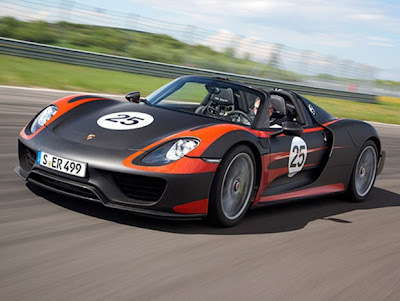 The two sports cars, which deliver an output of 887 bhp (652 kW), were equipped with the optional "Weissach package" to increase driving dynamics and the standard Michelin tires developed specifically for the 918 Spyder. The 2015 Porsche 918 Spyder will go on sale in the U.S. in early 2014 at a base MSRP of $845,000. 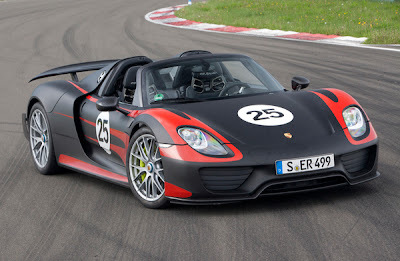 * 918 Spyder: combined fuel consumption: 3.3–3.0 l/100 km; combined energy consumption: 12.5–13.0 kWh/100 km. U.S. EPA Fuel Economy figures will be available closer to the car’s availability – early in 2014. Porsche Cars North America, Inc. (PCNA), based in Atlanta, Ga. is the exclusive U.S. importer of Porsche sports cars, the Cayenne SUV and Panamera sports sedan. Established in 1984, it is a wholly-owned subsidiary of Porsche AG, which is headquartered in Stuttgart, Germany, and employs approximately 220 people who provide parts, service, marketing and training for 189 dealers. They, in turn, work to provide Porsche customers with a best-in-class experience that is in keeping with the brand’s 63-year history and leadership in the advancement of vehicle performance, safety and efficiency. At the core of this success is Porsche's proud racing heritage that boasts some 30,000 motorsport wins to date. Drayson Racing recently set a land speed record of 204.2 miles/hr average speed over a measured mile at the Elvington Airfield, in Yorkshire. However that track wasn't long enough for them to fully test just how fast the Drayson B12 69/EV can go because they had to start braking while the car was still accelerating. As a result the team is taking a trip to ... Bonneville. They'll be at the Bonneville Speed Shootout for the next few days (Sept 12-18). This event is a chance to set FIA certified world land speed records. Drayson Racing is aiming for the sub-1000 kilogram electrically powered class. 10 September 2013 : Technology entrepreneur, former UK science minister and racing driver Lord (Paul) Drayson is bringing his spectacular Drayson B12 69/EV electric Le Mans Prototype racing car to the Bonneville Salt Flats in Utah in an attempt to raise the sub-1000kg electric car world land speed record. Drayson Racing achieved a 204.2mph average speed (subject to FIA homologation) over the measured mile earlier this summer at Elvington Airfield in Yorkshire, UK, and is aiming to go even faster at the much longer Bonneville track. By running in the sub-1000kg electric vehicle land speed record class, the team is aiming to demonstrate the future possibilities of EV technology and performance and to highlight the importance of lightweight in future electric car design. It’s the latest challenge to be undertaken by the pioneering electric motorsports firm, which has been at the forefront of sustainable racing since 2007 and was first to sign up for the new FIA Formula E championship having been scientific advisers to the series. The car is scheduled to run at the Bonneville Speed Shootout (Sept 12-18) where the fastest cars and motorcycles in the world aim to establish new FIA and FIM certified speed records. Lord Drayson, who will be aiming to top a previous sub-1000kg electric car best, is aiming to push the 800bhp B12/69 EV to its maximum possible speed during the US attempt. One of the team’s major backers and supporters is San Diego based, Qualcomm, a leading provider of wireless technology and services. The Drayson B12 record car incorporates Qualcomm’s pioneering Wireless Vehicle Electric Charging (WEVC) system that uses inductive wireless energy transfer to eliminate the plug-in cord used in most electric cars today. Qualcomm and Formula E have announced a multi-year agreement in which Qualcomm will become an Official Founding Technology Partner of the FIA Formula E Championship. The agreement will let Qualcomm showcase their Halo Wireless charging system, which will plausibly result in that wireless charging system gaining traction in the marketplace of electric car charging systems. The Qualcomm Halo system has been an interest of Drayson Racing, and has been present in their electric race car for a couple years. Drayson Racing was the first team to join the Formula E. While they will race with the SRT_01E cars during the first Formula E season, they intend to become Manufacturers during the second season. 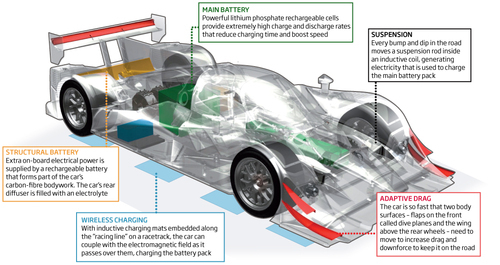 Coincidentally, or not, "The wireless charging system will be made available to the race cars from season two." The Qualcomm Halo WEVC technology uses "resonant magnetic induction" to transfer energy between a sending pad, and a receiving pad in a car. This is one of the wireless charging systems being developed for potential use in electric vehicles. The Halo team hopes to have pads installed in roads so that cars charge wirelessly while driving. 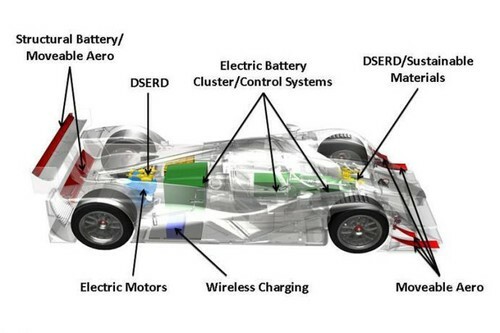 Drayson Racing hopes that a race car could be charged wirelessly in race conditions without having to make pit stops. That last point is of course one which is exacerbated by Formula E's rules. Namely, the cars being built for the 2014-15 season have a 20-25 minute racing time, and they want the races to last for an hour. To work around that problem, Formula E organizers have decided each team will have two cars and swap cars halfway through the race. But they come up a little bit short, 40-50 minutes of racing time with two cars in a race that's supposed to last for 60 minutes. Apparently the plan is to run the first car for the last 10ish minutes. But, if the fullness of the Qualcomm Halo vision were working .... but ... I have my doubts whether a race car, at race speeds, would pick up much energy while flying over the top of a wireless energy pad. I rather think they'd have had a better time of it by swapping battery packs during pit stops - because that's directly analogous to a gas powered racer refueling the tank. BERLIN, GERMANY (9th September, 2013) – Qualcomm Incorporated (NASDAQ: QCOM) today announced a multiyear agreement with Formula E Holdings (FEH) to become an Official Founding Technology Partner of the FIA Formula E Championship, the new international championship featuring racing cars powered exclusively by electric energy. The agreement will allow Qualcomm and FEH to showcase mobile and Electronic Vehicle technologies globally through an exhilarating sport and demonstrate how current and future generations all over the world, can benefit from wireless, sustainable technology on and off the track. As a leader in the mobile space, Qualcomm will advise FEH in their quest to incorporate new and more sustainable technologies into the racing series. As a start, Qualcomm Halo™ Wireless Electric Vehicle Charging (WEVC) technology will be adapted to be fitted into the 2014/2015 FIA Formula E Championship safety cars so they can be wirelessly charged. The wireless charging system will be made available to the race cars from season two. Qualcomm Halo WEVC technology uses resonant magnetic induction to transfer energy between a ground-based pad and a charging pad on the electric vehicle. Drivers simply park over the base pad and charging commences automatically. As part of its advisory role, Qualcomm will evaluate the connectivity and mobile technology of each of the ten venue cities around the world, providing solutions to help enhance the spectator experience around the circuit such as live streaming to fans, video gaming and social media.